“It would have been treacherous to take the road,” the wordsmith of the family commented as we began our cross-country ascent. The previous evening we had discovered our intended route was too dangerous to be comfortable (think big trucks on road with no shoulder), and so we had pored over the map considering alternatives. Taking the 7:20 bus along that treacherous 4km stretch of road was initially the favoured option, although no one really wanted to use any transport other than feet. But then I noticed that the hiking trail GR8 went right to the village we would be heading for. It would require a 3km backtrack to join the trail, and then the path itself would wind up hill and down dale for a good many more kilometres, but having heard these official French trails are well-marked, it was an alluring proposition. Sometimes in life you make a decision without fully comprehending at that moment what the full implications will be. This was to be one of those times; it would turn out to be both an inspired and inspiring choice. The rumours about the trail markings were well-founded. At every intersection, whether in a village or in a forest or at a stile in a meadow, not only would the right way be marked, but all the wrong options had a red and white cross painted onto them to further ensure your success. The markings might be on a tree or lamp post or fence post or wall or the side of a building – an absolute delight to follow. Although the hills we climbed were just as strenuous as ones on previous days, we walked with real peace. There was no low-grade anxiety like yesterday when the instructions had said to take the paved road at the intersection, but there wasn’t one and so we had continued about 4km before being certain we were on the right road. Actually, it was particularly interesting when the GR8 and La Voie de la Nive merged to the same path. 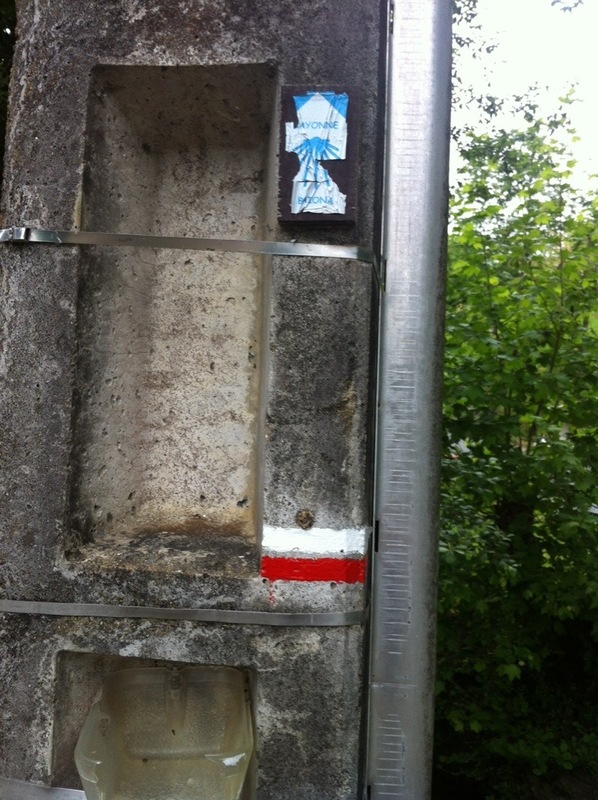 The distinctive red and white GR8 stripes continued to lead us, whereas the blue and yellow Bayonne markers were haphazard at best in their appearance. No wonder it has been a navigational challenge these past couple of days. By the time we got to Ustaritz we had covered 25km, it was already 2pm, and Bayonne was still 16km away. Levi and Micaiah both wanted to keep walking. So did I, for that matter. But I was very aware that while we feel good after 25km, it only takes another couple to change your whole outlook on life in general and walking in particular. Yes, we are probably getting stronger – nothing aches now – but were we really ready for a marathon? I decided, against common consensus, that if I could find a bus, we would take it. The section that we would skip today we would be walking tomorrow anyway, as La Voie de la Nive shares that portion with the Camino Baztan, which we are about to begin, so it’s not like we were going to miss out (and we’d had the added bonus of some GR8). And so it was we went by bus to Bayonne. Bayonne. What a beautiful little city. The centre is dominated by a beautiful cathedral, where we sat gazing upwards and wandering the perimeter feasting our eyes on the artwork. The surrounding cobbled streets are flanked by rows of three-storey shuttered houses, and bustling with people. Although the river is wider than Dutch canals, it feels very much like Amsterdam. It was to one of these houses just a block back from the river down a little alley we were bound. Here a German-French couple open their home and lives to pilgrims. On arrival we were served kefir (yay – our first since leaving home!) and the evening was spent in animated conversation about food supplies, the church and dreams! Before tucking in for the night, the boys closed the shutters, which seemed a quintessentially French thing to do! 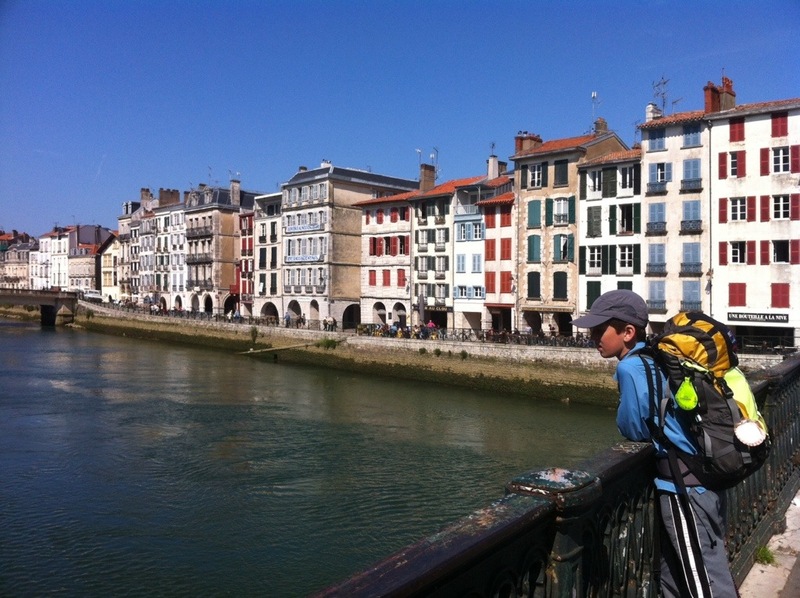 This entry was posted in 2014 walk-for-water, Camino de Santiago, France, La Voie de la Nive. Bookmark the permalink. Go the bus I say! Great work pilgrims and what a gorgeous little town Bayonne looks like. Sounds like the bus was a very wise choice. Another long day might cause the boys’ young bodies to falter despite their very willing hearts. 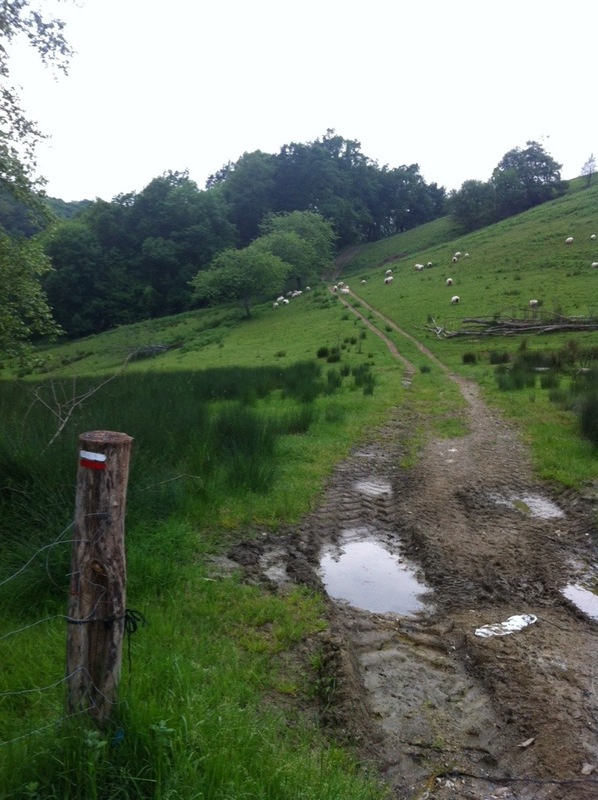 A friend of mine walked some of this Basque countryside last year and absolutely loved it. Bon Chemin! I get more impressed each day, by the challenges you are all taking (literally) in your stride! Looks like a lovely place. It is interesting to hear you acknowledging the difference in stress levels (even though low) that having a clearly marked route makes. The bus was a good decision, and the shot of the little town looks so different to NZ! Wow if I were dad or the girls I would be freaking out at the distances they will be walking!!!! !